If you are a fashion designer working away from your manufacturer or your team, communicating your design's details or sample corrections could be challenging. In this case, you either have to personally visit the factory or spend hours on Illustrator to draw detailed flats, so they understand the requirements. To overcome this communication obstacle and help designers accurately express their design requirements, we developed a smart tool called Annotation. This tool enables a tagging feature to comment or add notes on any specific detail of an image. 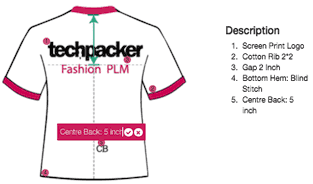 So when you include these sketches in your techpack, the factories can understand your exact design requirements and develop high-quality garments. Here's a quick guide on how to use Annotation tool. Once you start adding your cards, simply upload the flats you like to annotate. The image can be in PNG, JPG/JPEG, AI or PDF. For AI and PDF, remember to click on the arrow-up icon for successful file upload (see image below). Once the upload is done, the AI will be transformed into a JPG image. Save the card and create PDF ready techpacks to share with others.